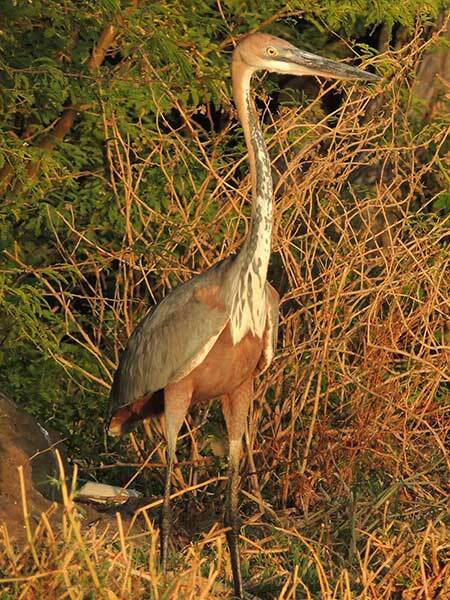 This is the world's largest heron. The height is 120–152 cm, the wingspan is 185–230 cm and the weight is 4–5 kg. In flight it has a slow and rather ponderous look and, unlike some other herons, its legs are not held horizontally. Male and female look similar, with an overall covering of slate gray and chestnut feathers. The head and its bushy crest, face, back and sides of the neck are chestnut. The chin, throat, foreneck and upper breast are white, with black streaks across the foreneck and upper breast. The lower breast and belly are buff with black streaks. The back and upper wings are slate-grey, with a chestnut shoulder patch at the bend of the wings when they're closed. The under-wing is pale chestnut. The upper mandible is black and the lores and orbital areas are yellow with a greenish tinge. The eyes are yellow while legs and feet are black. Juveniles look similar to the adults, but are paler. The only heron with somewhat similarly-colorful plumage characteristics, the widespread purple heron, is much smaller than the Goliath.